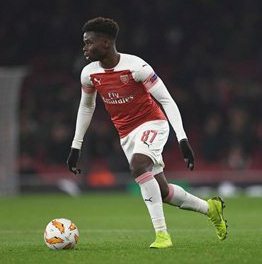 If statistics provided by OPTA are anything to go by, teenage Nigerian winger Bukayo Saka was Arsenal's most dangerous player against Qarabag FK, a game in which he made his home debut for the Gunners. The Hale End Academy product was the stats leader for four performance indicators : shots, shots on target, dribbles, most fouled player. Saka showed no fear playing against the Qarabag defense with an average age of 30.6 years and finished the match with a game-high eight dribbles, four more than the next player on the list, Eddie Nketiah who registered four take-ons. Only Rangers' Ryan Kent with ten completed more take-ons than Saka in a Europa League match this season. The 17-year-old also had a game-high four shots of which three were on target, more than the remaining twenty-seven players in action. It's not surprising that Saka was the most fouled player after winning five free-kicks but most importantly he came out of the game unscathed. With a rating of 8.19, he was Whoscored Player of the Match.